"We are now proud to pass the baton to farmers, brewers and researchers, who will hopefully take Scottish hops to the next stage of development"
After a four-year trial which saw the first harvest of Scottish hops in recent decades, scientists from the James Hutton Institute have created a practical guide booklet for farmers interested in growing the crop, which highlights its commercial potential in Scotland. The publication includes recommendations covering infrastructure, agronomic requirements, disease and pest threats, harvest and post-harvest handling. The Hutton experiment was established in 2014 in response to growing interest in craft brewing and the development of premium beers, which has led to an increasing emphasis in the provenance of raw materials and locally-sourced, high-quality ingredients. Professor Derek Stewart, Hutton agri-food sector leader, said: “Hops are perennial plants that are usually cultivated in warm temperate regions, and although historically they have been grown as far north as Aberdeen, they remain a rare crop in Scotland. 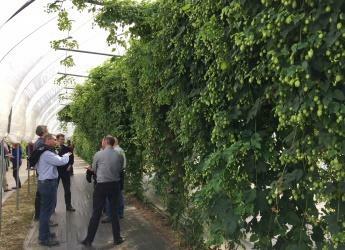 “The Institute created a particular environment to investigate the feasibility of growing hops including the development of special polytunnel infrastructure by our Farm, Field and Glasshouses team. A key finding of the trial is that there is a clear opportunity for locally-grown hops to supply the rapidly expanding craft brewing sector in Scotland. The choice of variety for growers should be decided upon after discussions with potential customers in the craft brewing sector. “Hopefully the work done at the Institute to date has demonstrated the underlying feasibility and potential of growing hops commercially in Scotland,” Professor Stewart added. Read our guidance booklet: “Hops in Scotland – A Rough Guide for Growers”.